As interest in Central Asia grows, more books are appearing in English about the region. One of my summer break titles was Jeffrey B. Lilley's excellent book Have the Mountains Fallen? examining the lives of two Kyrgyz writers. Azamat Altay fled to the West and was charged as a traitor in his homeland of Kyrgyzstan in Soviet Central Asia. Chingiz Aitmatov became a hero of Kyrgyzstan, propelled by family loss to write novels about the everyday lives of his fellow citizens. While both came from small villages in the beautiful mountainous countryside, they found themselves caught on opposite sides of the Cold War struggle between world superpowers. Altay became the voice of democracy on Radio Liberty, broadcasting back into his shuttered homeland, while Aitmatov rose through the ranks of Soviet society, a quiet rebel whose prose masked ugly truths about Soviet communism. Yet just as they seemed to be pulled apart by the divisions of the Cold War, they found their lives intersecting in compelling ways, joined by a common mission to save their people. Have the Mountains Fallen? traces the lives of these two men as they confronted the full threat and legacy of the Soviet empire. Through narratives of loss, love, and longing for a homeland forever changed, a clearer picture emerges of the struggle for freedom inside the Soviet Union during the Cold War. Former Kyrgyz President Roza Otunbayeva wrote: "It is impossible to understand today's Central Asia without knowing Kyrgyzstan, and impossible to understand Kyrgyzstan without reading this book. 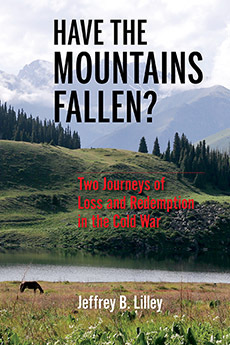 This is an insightful story of the terrible challenges that faced two courageous men and their dedication to preserving their nation, even 'when the mountains fall.' It is a thought-provoking book about the long journey of the Kyrgyz people to independence". Here is an excellent interview with the author, Jeffrey Lilley, on Voices on Central Asia's website. Order your copy through the major online bookstores.